I wanted to write a little bit about some of the methods I use when studying the scriptures. I have a few personal ones I like to use, such as coloring schemes, but they aren’t universally applied. I’ll cover those in later posts. The major part of all my studying can be summarized in two words: take notes. I have plain notebooks that I write in regularly, one for each area that I’m studying. And that’s it. I just grab a pen and jot down whatever I think when I’m reading. For me, studying the scriptures has to be as simple as possible, because I tend to drift in and out of it. I need to make the barrier to entry to resuming scripture study as small as possible for myself, and I can’t make it any simpler than this: to study the scriptures, just get pen and paper and write down whatever pops in my head. 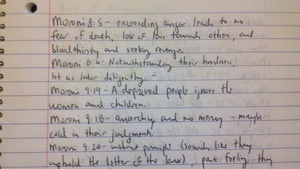 What happens is that as I take notes, it causes me to actually read the scriptures more closely than I normally would. Instead of just making it a ritual experience that I’m getting through as part of a daily routine, I pay attention, take more notes, and the cycle reinforces itself as what I write causes me to think more about the content. The approach towards note-taking is unstructured as well, so that it can apply to different levels of study: either in-depth or simple. That is, while it’s good to have personal scripture study methods, it’s unreasonable to expect myself to meet certain guidelines all the time. Doing that pushes me away, because it feels like I can’t meet my own standard of success. I’ve found that the blessings come from the desire to learn first and foremost, and I always feel like the Lord is pleased with me if I can at least have a desire to learn. On the other hand, effort without desire makes me not enjoy or look forward to the experience. For reading the Book of Mormon, I jot down one-liners because I’m not interested in an in-depth study at the moment. Every once in a while though, I’ll go into more detail about questions or thoughts that I had about a certain verse, but for the most part, it’s always a short sentence and anything beyond that doesn’t exceed a few lines. It works well for me. Plus, it’s fun to go back and re-read my notes that I’ve done previously. That always has the effect of making me want to study some more. I have only one book at a time that I would say I’m “studying” in-depth. 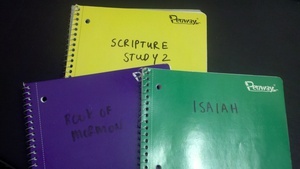 Last year, I was really into Isaiah for a few months and had covered reading and taking notes covering almost all the chapters. But then I took a break from the habit, and when I eventually came back, I couldn’t resume that old level of commitment and intensity. So, I started studying the book of Luke from the New Testament instead. And this time, in place of taking detailed notes, I decided to keep it simpler. My approach when starting over was to document the doctrine that could be found in the verses. And that’s all — a really small method that isn’t threatening or overwhelming as I get back in the habit of studying. If I have a break, for whatever reason, I don’t put myself under pressure, and I let my expectations reset as I start over again. Over time, the level of intensity will increase to where it was before, but only as I keep it a regular process.